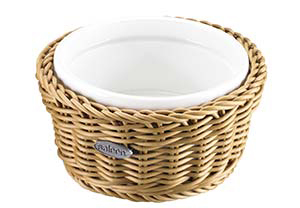 Easy-care hygienic synthetic wicker baskets combined with porcelain. The bowls are ideal for dips, gherkins, chilli, olives, crackers, pretzels and so on; in short, everything that enhances the taste at a buffet, party or at the family table. The great advantage is that if your guests happen to make a bit of a mess and olive oil or yoghurt gets on to the fibres then both baskets and porcelain bowls are happy to be cleaned in a dishwasher. They can also be used for stylish storage of cosmetics, jewellery, hair accessories and much more. Come with a 2 year guarantee. Dimensions: 13cm diameter x 6.5cm.